How do you get managers to buy into the fact that they need development? I posed this question to a group of professionals who mentor managers. Here’s what they said. Mentors agree that you can rely on a certain level of resistance when it comes to identifying development opportunities. It’s difficult to get managers to accept that they need development, let alone continuous development. When managers feel that development is unnecessary, they’re reluctant to participate in any form of assessment, or they participate in the assessment and then immediately ignore the results. They probably read but don’t follow the recommendations resulting from their assessments. Resistance is prevalent when the recommended areas of development are linked to “soft skills”. Resistance to development is often lower when the recommended areas of development involve the more “technical” or the “hard-skill” aspects of a manager’s job. If told that development is a requirement for keeping the job, managers usually comply. However, compliance without a development mandate can translate into minimal improvement. Optimally, employing a mentor, or coach, is the approach to better development and stronger results. Most resistors become ardent fans of development when engaged in the process and shown the “WIIFM” (what’s in it for me). Once managers understand the assessment, feedback, development, and reinforcements processes, AND the value of developing (the payoff for the work), development can proceed. With “buy-in” in place, development has to start with an assessment that measures skills aligned with the company goals, processes, and cultural expectations. Mentors recommended using 360° assessment tools to identify areas for development. My experience shows that 360° assessment instruments are used within larger companies whose management has experienced the benefits of assessment from multiple perspectives and continuous development. The use of 360s by executive management prompts lower level management to “do what the big boys do” and, therefore, require little, if any, inducement to follow suit. There are organizations where executives find it necessary to mandate the use of 360s at lower levels in the organization driven by dissatisfaction with performance at lower levels. More often, 360s are mandated because the executives believe that the use of 360s is good for leaders at all levels and provides a global benefit within the organization itself (if the expected follow-through is done after the assessment). Most organizations don’t use 360 assessments. So how do you get their managers to develop? Organizations that don’t use 360 assessments are often smaller and don’t have the resources to conduct formal assessments and development. It’s difficult to focus on personal development when the bosses are “up to their asses in alligators.” They don’t have anyone at a higher level of management to induce them to develop unless they are members of a franchise that requires development beyond “technical” development. So, how do you get these small businesses to investigate and buy into self-development when it’s prohibitive for a consultant to approach small business owners one potential client at time? Also, mass mailings and ads aimed towards small businesses are ignored. Many small business owners belong to business or trade associations. Efforts directed at these associations provides an opportunity to get in front of groups of small businesses where owners may be more receptive to assessment and development if some peers are finding benefits in development. The question may not be how to open the door, but rather how to find the correct door to knock on. Discussing the subject of development with small business owners can be successful when they’re engaged in a dialogue with questions focused on the needs of the organization before drawing connections to the manager’s ability to meet those needs. While asking questions, opportunities usually arise to suggest that the manager may be able to benefit from development in terms of the bottom line and the quality of their personal lives. Creating an emphasis around service and the values they want to establish within their company helps establish the credibility for the development discussion, because it’s relevant to their business and fits their personal goals. Describing how much development is possible through small, incremental efforts and not huge time or cash-consuming efforts is critical to having the owner commit to working to create change. You might also be able to suggest conducting a simple employee feedback survey about the leader’s capabilities. However, be forewarned that such a survey typically only provides useful information about the leader’s communications and leadership style as opposed to strategic and tactical needs of the business – still worthwhile feedback and worthy of pursuit. § An organizational culture exists that supports leadership development. § Performance feedback of some form is supplied and accepted as valid. § Personal drive to develop exists. § There is a significant cost or other consequence (like business failure) if they do not develop themselves beyond their current capabilities. Once again Pareto’s rule applies -- 20% of your leaders are going to be excellent leaders whether or not they are provided with development. 20% of the leaders are probably wrong for the company, don’t fit the culture, don’t produce, and really should not be developed – they should be reassigned to non-leader roles or dismissed. Your biggest opportunity is with the middle 60% who, with some coaching, can be turned on to the value and benefits of personal development. With a little coaching from the right mentor, they can be almost as strong as the upper 20%! Want some incentive for developing leaders? Send me your contact information and I’ll send you a copy of a white paper that shows the developed leaders enhance the bottom line by up to 200%. Ken Kuzia is the owner and consultant for Dupere Development Services, a Rochester, NY consulting service specializing in Organizational Development issues and a Senior Partner with Up Your Leadership. 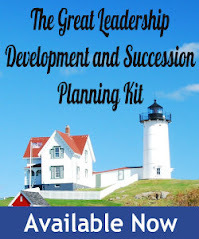 You are welcome to visit his website at http://www.UpYourLeadership.com. Contact Ken@UpYourLeadership.com.